If you are one the low-carb diet train but you love spaghetti, try spaghetti squash! This heirloom squash produces an oblong yellow fruit. So where does the spaghetti part come in? On the inside. When you have harvested, select a large pot and boil the entire squash for about 20 minutes. Remove from the water and cut into the fruit. Take out the seeds and then take a fork and scrape out the flesh. By using a fork the flesh will shred into strings that look like spaghetti. You can now top with your favorite spaghetti sauce or olive oil and herbs. 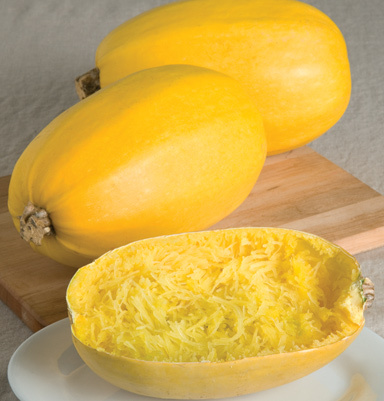 Spaghetti squash is not only low-carb and low-calorie, but it is a good source of folic acid, potassium, and vitamin A. It is also high in fiber and low in sodium. You might have to use garden shears to cut the stem when you harvest this unique squash. Each plant should produce 4-5 fruits so you may have some to store. Place in a single layer in a cool, dry place and they can keep for months. Height: Grows 10″ to 12″ tall. Outstanding Features: Spaghetti Squash can be grown vertically if you have limited space for a garden. Squash is very easy to grow and can be harvested all summer as long as you keep it picked to promote further production. Harvest when fruit is about 8-10 inches long for best flavor.